An internationally known researcher presents a comprehensive, illustrated analysis of mother-infant interactions. Using video microanalysis—which captures moment-to-moment sequences of interactions—Beatrice Beebe and her colleagues have turned their lens on the most primary of relationships, mother and infant. This process becomes a “social microscope,” enabling readers to see subtle details of interactions which are too rapid and complex to grasp in real time with the naked eye. These moment-to-moment sequences teach us to see how both infant and mother affect each other. We see that infants at four months are already extraordinarily communicative and responsive to the movements and emotions of the partner. 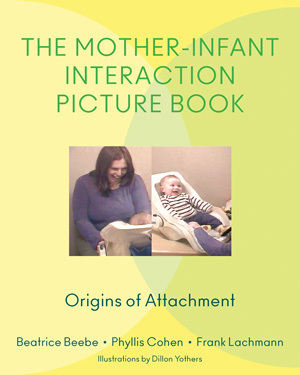 These interactions can be used to predict a range of future attachment styles. They enable researchers to translate infants’ nonverbal language and provide a unique and rare window into child development. Lushly illustrated by Dillon Yothers, these drawings reveal the emotions, but conceal the identities, of the mothers and infants.